Remember to follow up. Remember every detail. Let’s face it, you’re human and humans forget things. We forget to follow up or we can’t remember what we last spoke to a client about. That's where Daylite helps. Daylite is the Mac CRM that helps small businesses keep it all straight. Every follow up reminder, every email with a client, every call note, every meeting, every document – all in one place. Organize every email with your clients in one place. Create follow-up reminders and schedule appointments in your calendar – right from your inbox. Daylite is the only Mac CRM that integrates directly with Apple Mail. Imagine being able to easily sort your clients, leads, and vendors into specific lists for targeted reach outs. That’s what Daylite does. Sort by location, industry, project, role – even sort by when you last touched base with them. Bulk emails with customized email templates. Daylite does that too. You can also integrate Daylite with other email marketing tools like MailChimp. Organize all the moving pieces in your deals and projects in one place. Track all the emails, follow-ups, meetings, call notes, documents, and to dos – all in one place. 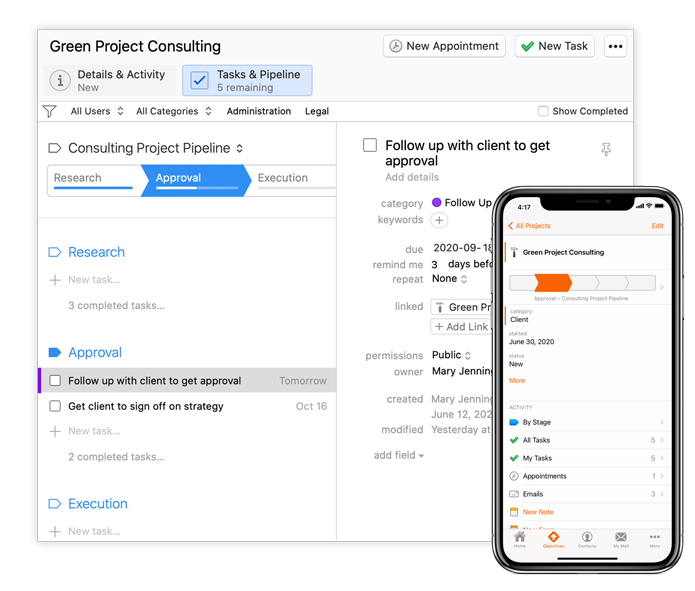 Unlike other CRMs that just help you close the deal, Daylite takes you all the way through finished project in one app. On the go? No internet connection? No problem. Daylite CRM gives you offline access on your Mac, iPhone & iPad. So you can stay on top of clients no matter where you go. Take your business further with Daylite. "Daylite has allowed us to increase our volume of business while still maintaining the high level of service our customers have come to expect."